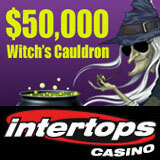 Someone must have cast a Halloween spell over the folks at Intertops Casino because you’d have to be bewitched to give away $50,000. On November 5th Intertops’ Witch’s Cauldron Grand Prize Draw will award bonuses and cash prizes up to $1000 and between now and then hundreds of players will discover a little extra cash in their accounts. The $50,000 Halloween casino bonus program is organized so both frequent and occasional players have a chance to win. Intertops groups players according to how much they play and awards bonuses in all categories. For the Halloween season, the categories are named after things you’d need to concoct a lucky spell: Eye of Newt, Scale of Dragon, Wool of Bat, a secret incantation and of course a Witch’s Cauldron. top “Witch’s Cauldron” level will win $1000 cash each; three players at each other level will also win prizes. Players can check their current points and ranking any time on the $50K Witch’s Cauldron scoreboard (http://casinopromotions.intertops.eu/october2012) where complete contest details can also be found. Twice a week, hundreds more players will be notified by email that they’ve received a free bonus up to $250. Intertops will give away a total of $50,000 between now and November 5th. Count Spectacular is a 25 pay line vampire-themed slot with free games and re-spin features. Goblin’s Treasure is a fantasy slot with free games and several jackpots and Warlock’s Spell, a 20 line magic-themed slots game, has a Potion Prize Pick feature.